RobVogt80s: Jeff Goldblum: More than Rachel's dad on "Glee"
His most recent role may have been as one of Rachel Berry's dads in "Glee", but Jeff Goldblum really began to establish himself in the 1980s. It was his birthday three days ago, and it reminded me of how long I have watched Goldblum perform. 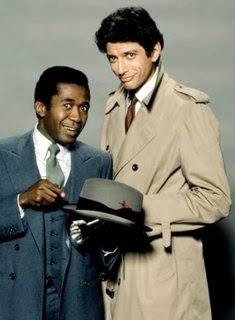 The decade opened with Goldblum starring opposite Ben Vereen in "Tenspeed and Brownshoe" in 1980, one of the first private detective series created by Stephen J. Cannell, and his first independent production. Cannell is another writing role model of mine. The show was on Channel 7 and I caught a couple episodes before it just disappeared, as shows often did on peasant vision. Wikipedia reveals the show had a great start, due in part to heavy promotion, but tailed off in the ratings and only 14 episodes were made. I don't have many memories of the show, but last summer I bought it on DVD so I look forward to watching it. I do remember it paying homage to film noir, hard-boiled detective novels, and one episode about the Black Dahlia murders though. 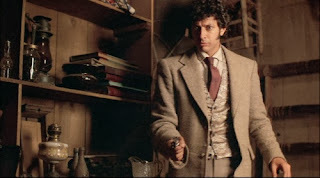 Jeff Goldblum as Slick in "Silverado"
Goldblum had parts in "The Right Stuff", "The Big Chill", "The Adventures of Buckaroo Banzai Across the 8th Dimension", and "Transylvania 6-5000", but the next role I recall was a duplicitous character in the 1985 western "Silverado". That movie is my favourite western, and Goldblum, like co-star Brian Dennehy, go against type and play villains. Goldblum is excellent as Slick, a gambler who has taken up with Rae, the sister of Mal (played by Danny Glover). He appears to be a decent guy, but double crosses Mal, only to suffer the ultimate comeuppance: Mal kills Slick with his own knife. Jeff Goldblum with Michelle Pfeiffer in "Into the Night"
Goldblum returned to the present day for his next role in "Into the Night". He is a depressed man who just discovered his wife cheating on him. He drives to the airport where a jewel smuggler (played by Michelle Pfeiffer) lands on his car, and she persuades him to drive her somewhere. Of course adventure ensues. It is another top notch performance as Goldblum plays a beleaguered man who can't quite resolve what is happening to him. Oddly, I did not see this movie until the summer of 1996. Growing up, I had made a list of movies I wanted to see. When I left my job at the University of Alberta on June 1, 1996, I took a year off and decided to go through that list. "Into the Night" was right near the top. 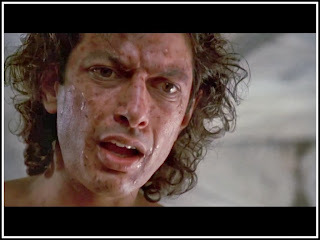 Jeff Goldblum in the 1986 horror film "The Fly"
The final movie I recall was in 1986 when "The Fly" came out. I don't recall a lot, because horror movies are not quite my taste. I do recall watching it at someone's house. The other thing about "The Fly" is that it established a pattern of "mad" scientist roles Goldblum would play. After we saw him in "Independence Day" in 1996, my good friend Jeremy said Goldblum's role as David Levinson was the logical extension of Ian Malcolm ("Jurassic Park") and Seth Brundle ("The Fly"). Jeff Goldblum would have more roles in the 1980s, including "Earth Girls Are Easy", "The Fly II", and "Beyond Therapy", as well as "Vibes", and "The Tall Guy", three movies I have never heard of. His greatest success would come in the 1990s and beyond with movies such as "Jurassic Park" and "Independence Day", and the television series "Law and Order: Criminal Intent". What always struck me about Jeff Goldblum, beyond his height (he was a tall actor, even on the screen), was his versatility in the 1980s. He was a private eye on television, then a wild west weasel, a man with bad luck that turned good, and a scientist with really bad luck. He was always endearing and engaging, and continued to be so for the next twenty-plus years. "Independence Day" is one of my favourite science fiction movies, and he plays a big part in that. Turning up as one of Rachel Berry's two dads on "Glee" was the next step in a career of varied roles.